We were still getting our forecasts from both Meteo Consult and fromCommander Weather, our routing company. The owner’s brother had a penchant for going off in the RIB on exploration trips by himself after having dropped off the shore party. The area was so mountainous that we lost VHF communication immediately as soon as he passed the bend in the fjord. In future I made him always go with the chief engineer and a full set of spares. The number two boat was kept for emergencies and for dropping off shore parties in the immediate vicinity of the yacht. A major climbing trip was planned but a scheme to camp on the glacier was scrapped on the recommendation of Tim. The weather is too unpredictable in South Georgia as many people have found out and anyway the forecast was not good. While walking on the foreshore next to the yacht I found a whale harpoon that must have been fired at a whale but the explosive head that contains half a pound of black powder had not discharged. Even if I had got it back to Antigua I could hardly see any of my chums being to keen on transporting a rusty harpoon with a live head back to Mallorca. I gave it to the museum instead, actually I never did ask Tim if he really wanted it in his museum, at the worst it will give the army something to do the next time they are around. I was walking in the snow above the beach where I found the harpoon and came to a place where the snow reached the foreshore. It was an irresistible opportunity. I sat down on the steep snow bank, laid back and threw my legs in the air gracelessly to the foreshore. In the afternoon I climbed the mountain on our starboard side. A long slug up steep broken rock and then through a couple of snow fields, round two lakes then again up broken rock until finally I had a view out over the Antarctic Ocean to the South. The view was magnificent. To the North West the view was of snow covered mountains and glaciers and to the South and East the ocean and icebergs. Coming back down the mountain I half destroyed my leather sea boots as I slipped and slithered down the scree. One of my onshore occupations in South Georgia was collecting seal teeth of which there seemed to be quite a few left in the skulls of dead animals. It turned out to be quite a useful pastime as when the weather closed in with gales and rain I could tinker with scrimshaw projects in the quiet of my cabin. Late in the afternoon I had the dreaded knock on my door to be told that Tom had taken a fall and he needed stitches in his head and his shoulder is dislocated. Thank God for the guests who were doctors on board. They did a nice job of stitching up his head. When it came to the shoulder Tom seemed to have his own ideas of how to get it back in place from a previous experience. The salon table was locked in the position and Tom lay on it facing aft with the dislocated shoulder hanging over the inboard side. Dr Brambilla gave him a shot of morphine and while waiting for it to take effect there was a lot of talk about what to do next. I am not quite sure who it was that popped the shoulder into place, it could have been Jacobo the mountain guide, it could have been one of the doctors. Whoever it was, they were very quick. While Tom was not seriously injured he had obviously had a bad fright but none of us realised just how far he had fallen until we were sailing out of Larsen Harbour a day later. Nick pointed out the scree slope where Tom was sitting when he came around at the pick up time. Tom must have gone down well over a hundred feet when he slipped on shale and slithered down a slope until he went over the edge of a cliff. Then he bounced twice on protruding rocks, only stopping when the small stones on the steep scree slope absorbed shock of his fall. Lashing rain and a full gale blows overhead. Too wet and cold to go out so everyone is sitting around totally bored. The weather eased off in the afternoon to the point where Andrea and Jacobo took their skis and climbed the snow on the steep face of the ravine on our port side. I went off down below as I didn’t like to watch their turns on the face of the snow as they swung their skis over to start the next diagonal of their climb. They did eventually give up and skied down in great style and only had to walk the very last part to the yacht. As usual in this sort of weather all the pressure falls on the chef, as there is nothing else to do but look forward to the next meal. The rain continued through the night that so that in the morning much of the snow had gone. The skiers would have had a problem in repeating the previous days exercise as where there had been snow the day before there was now bare rock. We spent a lot of time reading the weather reports and eventually decided that Commander Weather were being pessimistic. While the weather did not look good it had obviously changed and we decided to get out and see if we could make it to Stromness about 70 miles to the North West. It was after lunch before we had got all our gear back on board and then we still had to pick up the guests who had gone off to look at penguins. Overcast and drizzle with the Wind howling down the Drygalski Fjord. Brash and growlers were everywhere. Brash ice makes the most extraordinary noise, it and crackles in the water like an enormous gin and tonic poured on very cold ice. Double lookouts were posted and we our best to follow the same track that we had sailed down the coast. What wind there was, was on the nose and it was cold and wet. Those that were not needed on deck needed little encouragement to dive below. The ice had all moved about during the last couple of days and there were now some very large bergs close to the coast that were very useful as they provided a lee at least for a while. I admit that we had become quite blasé about icebergs as we realised that they did not pose a problem in daylight and clear weather and it was possible to pass very close without danger. We made the anchorage in Stromness with the last of the light and let go in 50 metres. There was a slight swell but nothing to trouble us. The port cable lifter had always been a problem as the chain jumps and twists. We had developed a short cut for taking the kinks out of the chain using a one metre long winch handle which fitted into the chain links and then with someone else operating the power the chain could be straightened back on to the cable lifter. Quite what happened I do not know, but the chain must have slipped and jumped, or maybe because we usually did this exercise in daylight and in relatively shallow water, the result was that the handle gave Gavin a whack on the chin which knocked him out and shut his mouth so fast that he broke numerous teeth in his head. There was not a lot to be done so Gavin was given a lot of painkillers and put into his bunk. He had almost no external damage at all, just a nick on the underside of the chin it seemed hardly possible to have done so much damage to the inside. Gavin was still in a lot of pain and is being fed on painkillers. All the guests were up at 05:30 for an excursion to the factory at Leith. This was the last of the whaling stations to close down in 1965, though I believe that the Whaling itself stopped in 1961. They were all back on board and eating their breakfast by seven. Next on the day’s agenda was to get all kitted out to cover the last part of the Shackleton Walk. This was the part where Shackleton and his two companions, Tom Crean and Frank Worsely, walked across from Fortuna Bay to Stromness. The manager’s house is still there and so is the bathtub where Shackleton had his first bath in twenty-nine months. As all the buildings are in danger of collapse Tim Carr had asked me if we could get the bath tub out of the house and take it from there to the museum at Grytviken. Now who could resist a challenge like that? So while the guests started their walk to Fortuna Bay, myself and three other crew members were busy trying to get a cast iron bath out of a bathroom and down some very rickety and rotten stairs and out on to the beach. It was not helped by having all the Windows in the house nailed shut against the storms that meant we were working in almost total darkness. The destruction at these Whaling stations is astonishing to see, as apart from the robbers, the army, the salvagers and the weather there are also the seals. The seals love the houses and the ruins. They are in the cupboards under the sinks, they are in the sheds, they are tucked in among pieces of abandoned machinery. If a door is left open they are up the stairs and into every room in the house. Most are fur seals but there are also large numbers of elephant seal cows. The elephant seal cow is gregarious and likes to get as many into a shed as will fit and there they lie in an ever-deepening puddle of excrement and urine, I suppose until the liquid level gets up to the nose. With Sir Ernest’s bathtub safely lashed down on deck, we got our anchor and headed for Fortuna Bay to our guests. 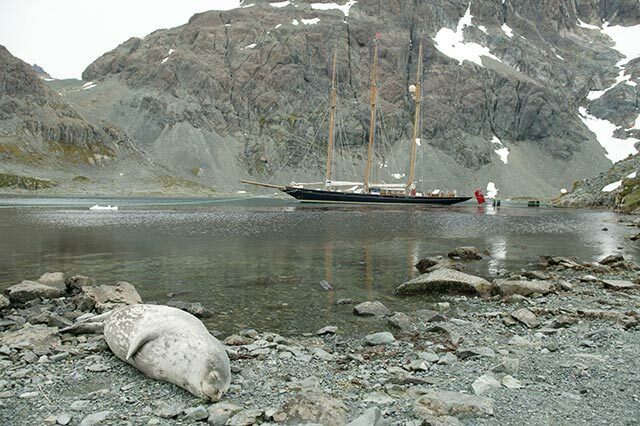 This, the Western end of the Island is a lot colder and it is not for nothing that among the charter yachts that Work the coast from Grytviken to the South East it is know as the banana coast. It was snowing when the boat went ashore for the pick up, managing to find shelter under the lee of some rocks. As soon as the guests were on board we set off for the Bay of Isles. There were two objectives, the to Visit the King Penguin colony on the beach and foreshore at a place called Salisbury Plain and the second to visit the Albatross nesting ground on, logically, Albatross Island. We made the anchorage off Salisbury Plain in a gale of wind with snow flurries. Even from the anchorage you could see the penguins, they covered not only the foreshore but also the low hillside behind, maybe 100,000 of them. The guests and some of the crew went ashore, I went in with the pick up boat and again we had problems with the big RIB. Running it on to the beach, so the guests could board, made it impossible to launch the boat back through the surf, it was just too heavy and the end result was that we all ended up thoroughly wet. From the beach the boat would be lost to view in the rain and sleet. The Albatross Island anchorage proved to be difficult as it was deep with indifferent holding and the wind was still gusting hard. I would have been better using the Fisherman anchor as it would have held better than the Danforth, but as I wanted to make it to the Prince Olav whaling station before dark I was looking to save the time that handling the Fisherman would take. The Albatross Island visit was a great success and photos were taken of the albatross’ mating dance, so the guests were all happy. It was a short run back to Prince Olav Harbour and we dropped anchor there at eight fifteen, bitterly cold but not much wind. The doctors settled down in the evening and had a go at fitting caps to Gavins teeth using the contents of the dental emergency kit. Gavin was looking better but still in obvious pain. Tom had improved and though still full of aches and pains was looking to be put back into the watch routine again.